Why won't my toilet flush solids out? Home / Lakewood Ranch Plumber / Why won’t my toilet flush solids out? Why won’t my toilet flush solids out? Many years ago, toilets, water closets or hoppers as they were called back when, used 7.5 gallons of water. 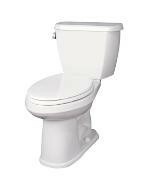 Most people never had a problem with their toilet not flushing out all the solids. Today, with the federal water conservation act, toilets are mandated to use 1.6 gallons or less to do the same job. Unfortunately, some of these newer toilets don’t work as well as the old 7.5 gallon water closets. Some important things to check that your Lakewood ranch plumber would tell you on the phone would be; lift off the tank lid and make sure the water level is up to the factory water mark line. This is usually one inch or less below the overflow tube in your toilet tank. Raise the water level if is lower than that, because this makes a huge difference in how toilets flush. Second, check the jet hole in the front of the bowl under the water. this hole should be clear and you should feel the water jetting out of it when you flush it. If the jet hole appears to be clogged up, it is usually from hard water deposits such as calcium and lime. I know a plumber in Sarasota that will use the special tool, part # 446108-A, commonly known as a bent clothes hanger, to poke in the jet hole to break away the deposits. this will work quite well along with a small screwdriver. Now, if you were used to larger volume holding tanks on your old toilet and a Bradenton plumber installed a new water closet for you, and you are having trouble with your new toilet not flushing out all the solids, try flushing more frequently. Also, if you use less paper this may help. Holding the trip lever down until all the water empties the tank will usually help clear the bowl so the solids flush out completely. The water closet Wimpy’s Dependable Plumbing recommends, is the Gerber Avalanche water closet, in an elongated, comfort height model. This particular model has a large water spot in the bowl, which is more sanitary. Also, it does a very good job of flushing out the solids with the first flush.